Bone (Marek Ratassepp) is a drum’n’bass producer from tiny Estonia. He started his explorations in music production back in 2004 and since then he has been slowly but surely covering the whole spectrum of drum & bass. An artist with great versatility, one moment offering up long flowing bass notes, heartbreaking female vocals and really tender drums… The next he comes with kick drums that remind you of mini-explosions, male vocals from the deepest depths and bass lines that makes old people cry. Anyway it comes, Bone presents tight and intricate compositions for all to enjoy. In 2012 he won the ‘Best Newcomer’ award at annual Drum & Bass awards gala run by Estonian National Radio and to date his tunes have been released by labels like Offworld Recordings, IM:Ltd, Through Sounds and Authentic Music. 2014 and beyond looks busy for Bone. already prepped are a string of releases to follow here on Broken Audio, plus Authentic Music & Violation to name but a few. 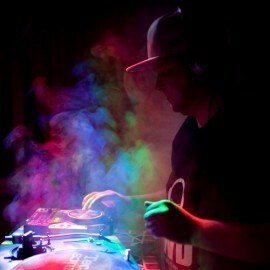 Regular DJ support coming from John B, Soul Intent, Technimatic, Quadrant, DBR UK and Mr Bang-E (C-Sonix) etc. 2. Greatest influence on your music? 3. Beach lover or studio tan? 5. What is the high point of your musical career to date? Winning the Estonia's National Drum & Bass Awards "Best Newcomer 2012" title.